Our teeth are super strong and usually carry out a millions of chewing movements each year. With time some teeth become damaged or affected by decay or both. In adults gum disease can also cause tooth loss leading to reduced function when eating. The aesthetic problems that missing front teeth will pose is also a major problem. For many years removable denture have been the recommended solution for missing front teeth. Dentures are made of either acrylic or chrome cobalt and have been used to replace the missing front teeth. Unfortunately dentures are not very popular as people start to appreciate the improvements that dentistry has seen recently. Dental implants can replace missing front teeth. 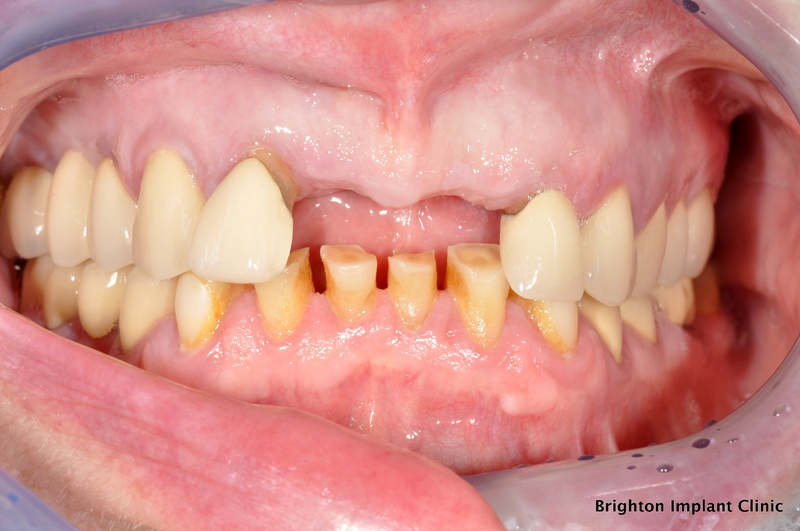 A clinical case of a patient who was wearing a removable upper partial denture for 3 upper missing front teeth. The patient had the denture made 3 years before when the teeth were first removed. The patient found the denture to be uncomfortable, affected taste sensation and generally caused the mouth to become sore after prolonged use. Usually the dentures are well made however they hardly ever fit well. Patients often complain that dentures dont feel like their own teeth. Generally dentures move around when eating and speaking. The use of denture adhesives is not popular as many complain of the adhesives being messy and difficult to tolerate. Even for a small denture replacing just a few missing front teeth can be difficult to cope with. Dental implants are small titanium rods placed into the jaw bone which allow for permanent fixed teeth to be secured onto the dental implants. As we saw on the clinical case above of missing front teeth, after the surgery the implants need to be left for a few months in order for them to heal completely. During that time the bone grows around the implants and fuses with the titanium surface. This process is known as osseo-integration. Dental implants have been shown to be successful in almost 98% of cases when assessed on average after 5 years. The union between the bone tissue and the titanium surface is stronger than between natural teeth and bone. 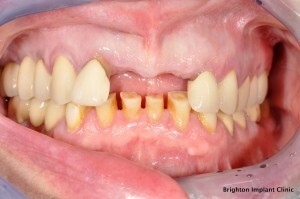 In this case dental implants were used to replace the upper missing front teeth. The patient was very happy with the final result given that the patient had worn a removable denture for several years. The procedure itself can be carried out under local anaesthetic or sedation. Usually the surgery to replace missing front teeth will take about one and half hours to complete. The whole treatment from start to finish will take four to six months to complete. Dental implants are highly effective and predictable means of replacing missing front teeth. With success rates of higher than 95% , dental implants are the best solution for damaged or missing teeth. Brighton Implant Clinic is a leading dental implant clinic based in Sussex. The group has three clinics based in Hove, Brighton and Hailsham. The clinic is well known for providing affordable high quality dental implant treatment for patients across the UK. Brighton implant clinic was awarded two national awards in 2009 and 2010. Since then it has been shortlisted for several awards across the country. The clinic is one of the largest dental implant providers in the country and has become recognized as a leading dental implant clinic in the UK. Each of the clinics have an onsite dental CT scanner and the Hove branch has its own onsite dental laboratory as well. A new branch will be opening in Worthing in 2013. The new fixed teeth are strong, durable and very comfortable. Unlike natural teeth dental implants are not affected by dental decay. Dental implants are fixed into the jaw bone hence feel just like natural teeth. If you are suffering from missing front teeth consider dental implants as the ideal solution for you. Dental implants were discovered about 30 years ago and have become more popular recently as the prices of dental implants has come down. Implants are used widely in dentistry today to replace single or multiple teeth.